The fourth annual Buffalo Bloody Mary Fest hosted by Step Out Buffalo featuring Tommyrotter Distillery is back...back again! Ten local bars and restaurants will come together under one roof on Sunday March 3, 2019 for a friendly competition to see who makes “Buffalo’s Best Bloody Mary”, “Best Garnished Bloody Mary” and “Most Creative Bloody Mary” - and *YOU* are the taste-tester who decides the winners. Each attendee will get a sheet of 10 tasting tickets to try Bloody Mary samples from each of the 10 different local bars. 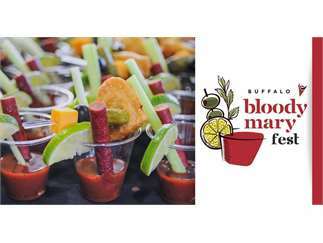 Attendees will then get to vote for which bars deserve the titles of "Buffalo's Best Bloody Mary", "Best Garnished Bloody Mary", and “Most Creative Bloody Mary” at the official voting booth. Does your bar make a killer Bloody Mary? Cost: TICKET TYPES: 1-4pm GENERAL ADMISSION TICKETS: ($35) Include admission to the event from 1-4 and one Bloody Mary taste from each participating bar. 12-4pm EARLY ADMISSION TICKETS: ($45) Include one hour early entry to the event from 12-4 (to beat the crowds) and one Bloody Mary taste from each participating bar. 12-4pm VIP TICKETS: ($60) Include one hour early entry to the event from 12-4, one Bloody Mary taste from each participating bar, exclusive access to the VIP lounge with private bathrooms, a private cash bar, a VIP-only food buffet, and more.